Jimmy Choo Teams Up with…Ugg Australia? We all went crazy to shop Jimmy Choo’s glamorous collection for H&M—and Ferocia and I (as well as many of you) walked away with jewelry and shoes that still get compliments to this day. So why am I not as thrilled about Jimmy Choo’s latest collaboration with Ugg Australia? Though I’m in love with the new Ugg boots for men (don’t judge until you see a pic! ), I’m curious to see how the red-carpet glamour of Jimmy Choo merges with Ugg’s casual, rugged aesthetic. Another reason I’m not jumping for joy? The prices will range from $595 – $795, which is still way out of my financial reach. The retailers have high hopes for the limited edition, five-piece collection, which will feature Ugg’s classic sheepskin boot concept “with design details that embody the spirit of the Jimmy Choo brand” via WWD.com. Spirit of Jimmy Choo? Ugg’s sheepskin boot? Huh? I can’t imagine what designs this collaboration will yield. Still, if anyone can make Uggs glamourous, Jimmy Choo can. The collection launches in October at select Jimmy Choo and Ugg Australia stores, select department stores and on both the companies’ websites. Are you looking forward to this collaboration? Do you think the brands are a good fit? Stop what you’re doing now…no, right now…and run to your nearest H&M! Jimmy Choo for H&M has finally hit stores and the glamorous collection is everything you’d expect and more!!! Ferocia and I pre-shopped the collection at the Editor Event on 5th Avenue last night and were both in shoe-shopping heaven. The store was transformed into a luxe boutique, perfect for a red-carpet fete. The mannequins, who never looked so fabulous, sat on plush couches surrounded by sparkling jewelry. 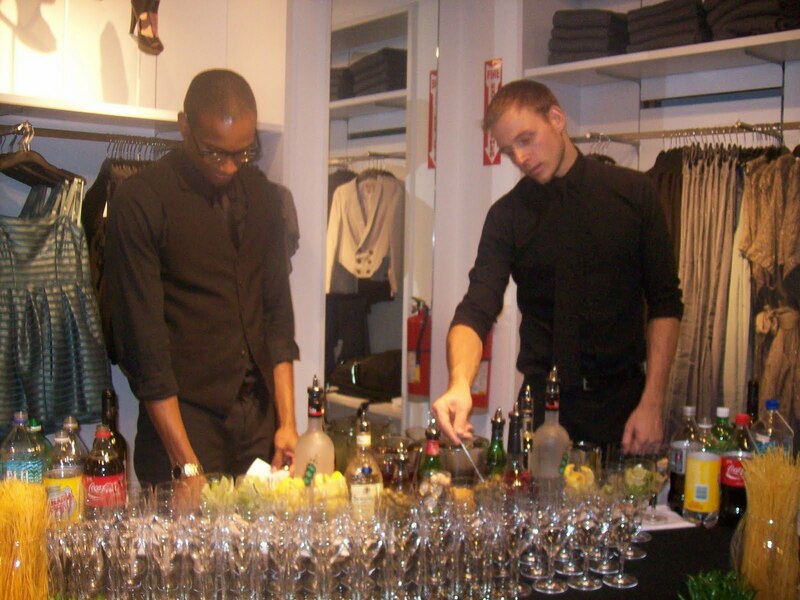 The bartenders and waiters (who easily could be models) kept the drinks and hors dourves coming. The incredible DJ, DJ M.O.S., spun the hottest records all night long from “Groove is in the Heart,” to classic 80’s Madonna and Michael Jackson. 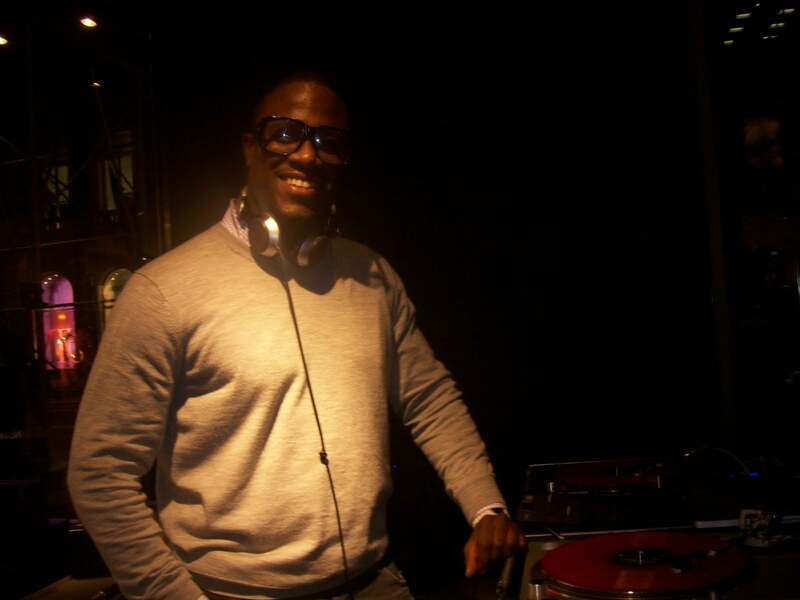 (One of the best DJ’s spinning in the city—and that says a lot because I am a music buff and hard to please. Check him out on djmosnyc.com and freshistheword.blogspot.com). 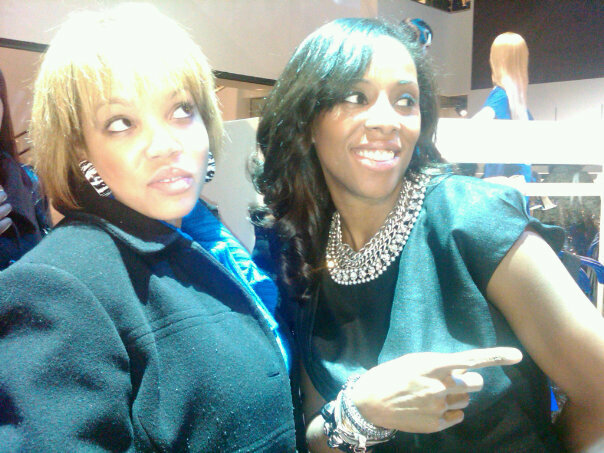 And celebrity stylist du jour, June Ambrose, came out for the event and even chatted with Ferocia about how much she loves our blog! Umm…we love YOU more. Thanks for reading! Can you imagine a better shopping party? However, most importantly, the collection blew our minds. Our favorites? Ferocia scored these studded black sandals and gray suede open toe booties (below)! And as I told you last month, I finally tried on and purchased my favorite cobalt blue patent leather shoes that look even better on my feet than they did in the promo pics (below)! You should know something about Ferocia and I – we like shoes more than chocolate, even more than boys. Example: Ferocia got stood up by her date (she’ll give you deets later) and the new shoes totally made up for it. I’ve had the week from Hades (my best friend lost her job, drama with the boo, etc. etc.) 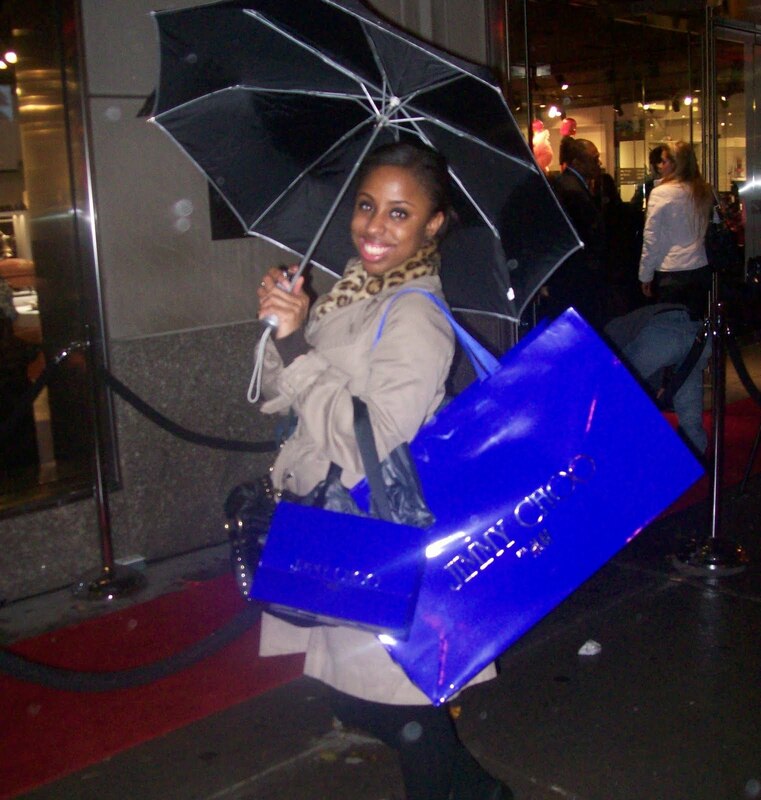 yet my shoe purchases (from Jimmy Choo for H&M and the Louboutin sample sale!) make me happy and never let me down! Retail therapy has never felt good. And we got a silver multistrand bracelet in the gift bags – amazing! Now that you’ve seen the pictures and read all the details—it’s finally time to shop! Send an email to theglamazonsblog@gmail.com or hit us on Twitter (@glamazonsblog) and let us know what you think about the collection and what amazing Jimmy Choo for H&M finds you added to your wardrobe! My job is hard. Why? Last-minute shoots and impossible deadlines aside, it’s SO hard to see, touch and even try on new clothes that I can’t own, like the Jimmy Choo for H&M collection. I am counting down the seconds and minutes until I can slip my toes into these haute cobalt blue sandals. Pure torture. And I want you to suffer with me. Feast your eyes on the cool, 80’s inspired collection of shoes (including these thigh-high boots I’ll show you tomorrow, major! ), jewelry AND clothing and tell me what you plan on buying when it hits stores November 14th. Just when you thought Target was the leader in designer collaborations, H&M lands the deal of all deals: a collaboration with the God of Accessories brands, Jimmy Choo. This fall, budget-conscious fashionistas can shop like the stars, snagging red-carpet worthy Jimmy Choo styles at 250 H&M stores. I’ll be wearing my party pieces by Jimmy Choo for H&M that night, and every day and night after, lol. See you at H&M on November 14th when the collection hits stores!